Light Tool Supply: United States Car Companies get a little September sales boost!!! United States Car Companies get a little September sales boost!!! General Motors Co, the largest U.S. automaker, reported a 1.5 percent increase in September auto sales on the strength of its passenger car sales, while Ford Motor Co posted sales that were on par with its results from a year earlier. Chrysler Group LLC, the smallest U.S. automaker, showed a 12 percent jump in sales to 142,041, marking its best September since 2007. GM reported its strongest September since 2008, selling 210,245 cars and trucks for the month. Ford sold 174,976 cars and trucks in September, compared with 175,199 in September 2011. The No. 2 U.S. automaker said its retail sales to consumers rose 4 percent. Both GM and Ford noted that sales of small cars such as the Chevrolet Cruze and the Ford Focus were strong. GM sales in this segment nearly doubled last month, while Ford surged 73 percent. "Passenger cars have been the launch point for a broad and deep GM product offensive," said Kurt McNeil, vice president of U.S. sales operations. GM had forecast the annual sales pace for September would come in around 14.5 million, on par with Wall Street estimates. Attractive financing offers, cash incentives on trucks and pent-up demand fueled September sales. Chrysler, majority owned by Italy's Fiat SpA, predicted that the sales rate would be 14.9 million for last month, including medium and heavy trucks. Typically, medium and heavy trucks add around 300,000 vehicles to the sales rate, suggesting a 14.6 million pace for light vehicles for September. Last month, incentives on trucks averaged more than $3,000 a vehicle compared with $1,888 for cars, according to TrueCar.com. Sales of the company's new Dodge Dart, introduced earlier this year, continue to rise. 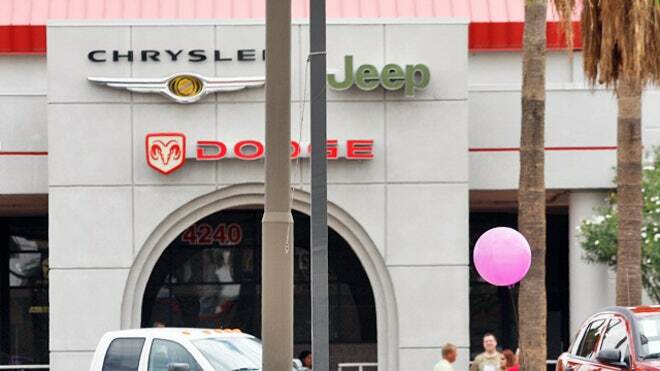 Chrysler said it sold 5,235 Darts in September, a 72 percent jump from August. Fiat brand sales totaled 4,176, the highest monthly mark ever in the United States, Chrysler said.